Disney Parks are great places to visit for the whole family, but bringing the whole family can get a bit costly. Instead of buying ears at the parks, make your own DIY Mickey ears at home! Since opening day, Mickey Ears hats and Mickey Ears have been iconic as a representation of the even more iconic parks. When at the park, you can spend $20-$40 on a single hat, or instead you can make your own. Why should I try making DIY Mickey ears? Hotels, tickets, food, snacks, drinks, pictures, and souvenirs all add up quickly especially when you have a big family. The good part about that costly price is that it might encourage you to get creative! Making your Mickey ears at home can save you bunches but also allow you to participate in one of the most fun trends happening in the Disney universe! Can I use these DIY Mickey ears for Disneybounding?! Absolutely! If you are a true Disney fan, you know what “Disneybounding” is, and this is a great way to help with your bounding! If you need some help to get your creative DIY Mickey Ears juices flowing you can check out this awesome list of ideas! Do you have any of your own DIY Mickey Ears tutorials? What do I need to make my own Disney Mickey Mouse Ears? Each tutorial will be different depending on the style of DIY Disney Ears you are making. These are some of the general items that I would suggest you have on hand for starting any DIY Mickey Ears tutorial! These DIY Mickey Ears tutorials will have you and your family park ready in no time! Chewbacca Mickey Ears | Eclectic Momsense | Raise a hand if you are both a Disney fan and a Star Wars fan?! If so, you’ll need to check out these amazing Chewbacca Mickey Ears. DIY Mickey Ears | Moms Without Answers | If you are looking for a truly iconic and traditional Mickey ears tutorial, this is for you! This classic look will never go out of style. Floral Minnie Ears | Bloglovin’ | Flower power to the rescue! These gorgeous floral Minnie ears will make everyone smile! 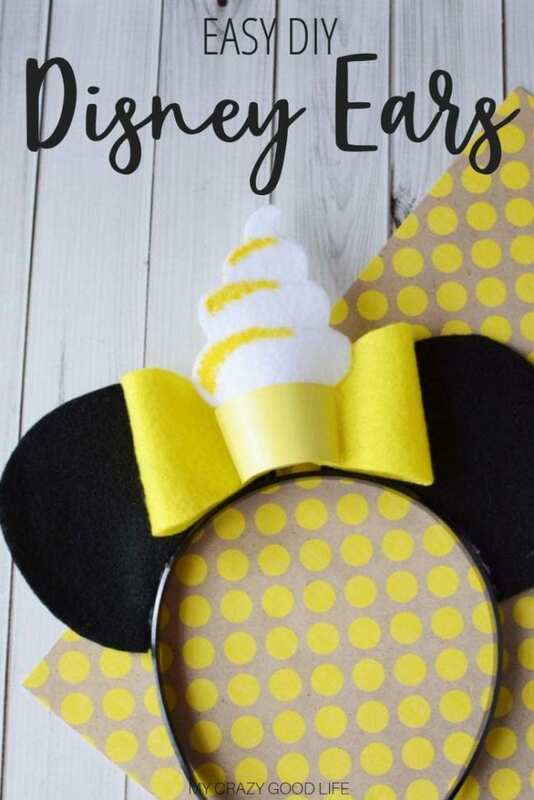 How to Make Custom Ears | Disney Fashionista | Just want to learn how to turn your great ideas into custom DIY Mickey ears? Check out this tutorial on how to make custom ears for your next Disney visit! Little Mermaid Ears | See Vanessa Craft | I have to admit, I’m a sucker for these Little Mermaid Mickey Ears. They’re so cute and who doesn’t love our favorite Disney mermaid?! DIY Minnie Ears | Dixie Delights Online | It’s not all about Mickey over here…Minnie needs some representation as well! These cute DIY Minnie Mouse Ears are great for making a whole family set of DIY ears! Jack Skellington Ears | My Printly | Need a more unique look?! Something off the beaten path? These Jack Skellington Ears are super cute and easy to make, definitely won’t have a Disney twin when you visit the park wearing these! Sorcerer Mickey Ears | Style/Disney | Sorcerer Mickey is a classic look. If you want to spice up your DIY Mickey ears look a bit, this fun twist is for you. Star Wars Ears | Mom Endeavors | Star Wars Ears are so much fun and they’re easy to make. DIY Mickey ears never looked this good…some might say they’re OUT OF THIS WORLD! Floral Rapunzel Ears | The Disney Diaries | Any princess lovers out there?! If so, you want to check out these Rapunzel ears. They’re flowery and gorgeous and perfect for your favorite princess fan. Dumbo Mickey Ears | Bombshell Bling | Who is excited for the new Dumbo movie?! Celebrate the fun new release with these DIY Mickey ears that are representing our favorite elephant. Classic Princess Mickey Ears Video Tutorial | Auntie Tay | You really can’t go wrong when making DIY Mickey ears if you stick to the princesses, right? Mickey Glow Ears | Undercover Tourist | If you are going to be visiting the park after dark you’ll want to make sure to create a pair of these DIY Mickey ears that glow! Ear Baseball Cap | Can Do Momma | Not into headbands? Totally not a problem with this great tutorial that takes your favorite baseball cap and turns them into your Disney ears! Christmas Ears | Occasionally Crafty | If your Disneybounding takes you to the parks around Christmas you will want a festive pair of Disney ears for sure! Classic Ears | Two of A Kind Working on A Full House | The tried and true classic Disney ears are here for you…and much cheaper than buying them in the park! Minnie Ears Fascinator | This Fairy Tale Life | Not interested in a hat but want something more than a headband? I got you covered. Check out this tutorial for a Minnie Ears Fascinator! Super cute and totally unique! Bride and Groom Baseball Ears | Disney Travel Babble | How many of you are Disneybounding during your wedding or honeymoon?! If so, you will need these bride and groom Disney ears to help you share your exciting new status with the world. Custom Ears | Touring Plans | Custom Disney Mickey ears are easy to make and so much cheaper than the ones you can buy in the parks. Making your custom ears at home also means you can have multiple pairs! Princess Themed Ears | Creativity in Pieces | There’s just something extra magical about the Disney princesses, these princess themed ears are super cute and perfect for your next trip to Disney. Lacey Ears Bunny and Mickey Versions | Monoxious | Looking for something totally different?! How about some bunny ears! Mickey won’t even know what to do when he sees you with these super cute ears! Mickey Ice Cream Bar Ears | Domestic Goddess Confessions | Who doesn’t love some ice cream? 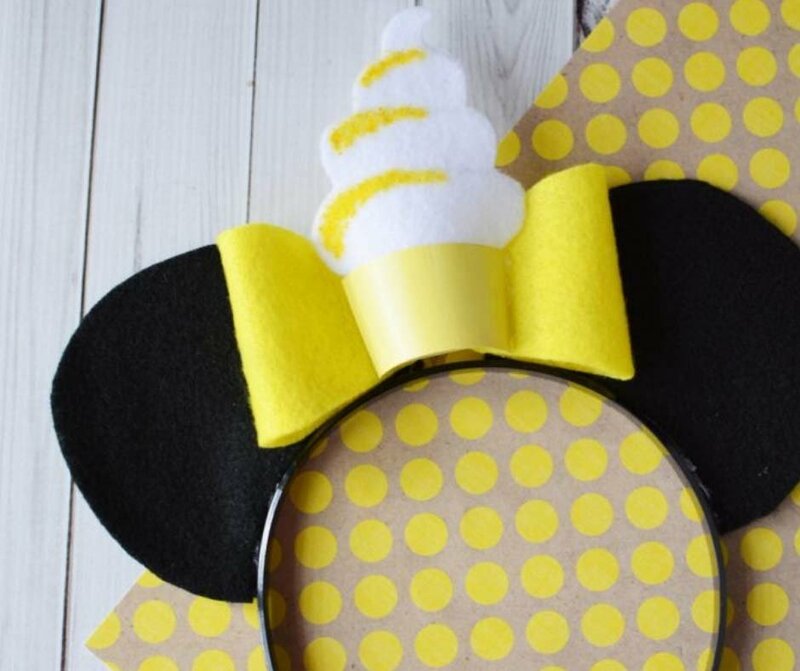 Combine your two favorite things when you make these DIY Mickey ears with an ice cream theme! BB-8 Mouse Ears | Off To Neverland | What kind of Star Wars Disneybounding would be complete without a little BB-8?! Minnie Ears | Fun Family Crafts | These Disney Minnie Ears are super cute, festive, and fun. Perfect for spicing up your best Disney outfit! Sleeping Beauty Ears | Falon Loves Life | No Disney Princess squad is complete without a sleeping beauty! Make sure you give this fun princess ears tutorial a try! What a great collection of Mickey ears, so creative.